An amazing scenery, a windy but cheerful ambiance and a fantastic team of 20 motivated persons...we had a great combination to make a success of our first clean up at Mahebourg. Located in the southern part of the island, the old town, known for its famous Musée de Mahebourg, is a striking example of simplicity and calm. 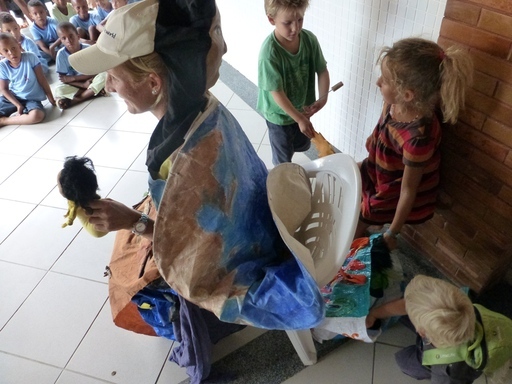 Its inhabitants were attentive to our group, watching us wander around in our clean up, as we started from the Mahebourg Waterfront and strolled back in town, whilst collecting all bits of plastic we encountered. 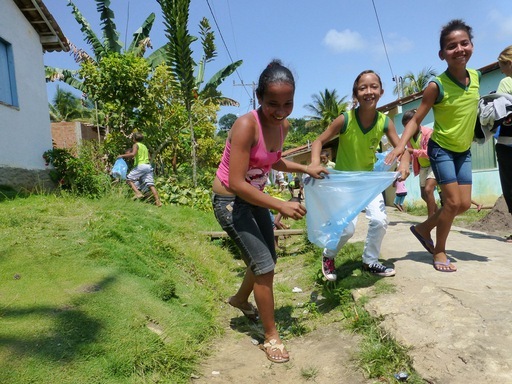 At first glance we thought we would have to include the neighbourhood of Mahebourg in our cleanup as the town seemed relatively clean. However, to our shock, we spent three hours cleaning up the waterfront and part of a street over two blocks of houses. 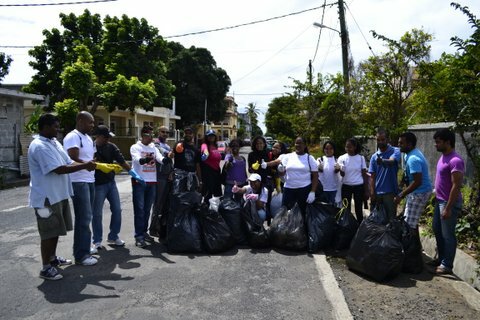 For the first time in a cleanup activity by ToptoTop Mauritius, we spent so much time on such a short distance. We gathered 17 bags of plastic waste! This activity was very special for it was jointly organised with the help of inhabitants of Mahebourg; Siva Pareemanen, Arvin Lifor, Manoj Baboolall, Ashive Kanoosingh, Ovilen Dorasami and Kamlesh Sooram and who are new recruits of ToptoTop Mauritius. We were supported in our initiative by a group of young volunteers from the Groupe 40 from Curepipe who were fantastic in their enthusiasm and determination: Ashley Pierre, Yannick Casquette, Sabrina Achille, Rosabelle Fanny, Anne Lise Huet, Aurelie Mardiapoulle, Stephanie Tickfire, Lucilla and their friends are beautiful persons and they generously gave of their time and energy to make Mahebourg a cleaner place. They are keen to participate in ToptoTop clean ups. We also had the opportunity to discuss with local inhabitants on the importance of keeping their environment clean for their children and families. A group of young kids from primary school were interested in our activity and are keen to join us in clean ups in the neighbourhood. We had a beautiful day, and everyone left Mahebourg on a note of happiness. This feeling of satisfaction was shared by all of us. "Ce fut une belle journée, j'ai bien ramassé les ordures à Mahebourg. Je ne pensais pas que c'était si mal entretenue car je fréquente cet endroit depuis ma petite enfance. Pendant ma traversée dans les rues, les gens se sont mêmes rapprochés pour demander ce que nous faisions et d'où nous venons. C'était aussi un temps de sensibilisation pour les Mahebourgeois car ils ont pu s'apercevoir par notre geste, qu'ils polluent l'environnement. Je suis très contente car j'ai pu faire passer le message à tout le monde - en ce cas, l'importance de garder l'environnement propre. Hâte d'être à la prochaine mission. Belle expérience de vie d'avoir travaillé avec les ONG. Bonne continuation »-Sabrina Achille, Groupe 40. Kamlesh Sooram : " We had a great time and the objectives of ToptoTop are awesome." "C'était une super journée. J'ai découvert que des petits efforts faisaient grand bien à l'environnement de mon pays et de ma région. " Stéphanie Tickfire, Groupe 40. Dario, ToptoTop Mauritius : "Today's activity was awesome. In about two hours we collected about 17 bags of plastic waste. It may seem little, but to eat an elephant, its one bite at a time." Michael, ToptoTop Mauritius: " Nice day. Very enthusiastic." 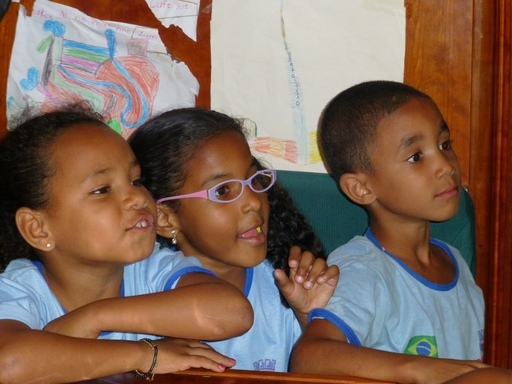 We had a last presentation at the Yacht Club of Rio. 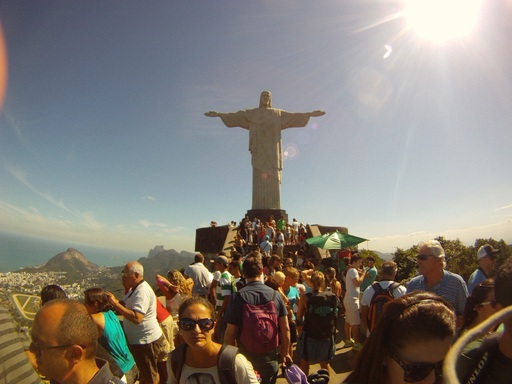 We climbed together with SY Byamee Corcovado Mountain and on our 11th wedding anniversary last time the Sugarloaf. The stop in Rio we used also to organize our US visa and got invited to check our skin for cancer. The funniest thing was the arrival of Annemarie's Easter present, after 5 month on the way from Switzerland. The Swiss chocolate was all melted to a big ball, but it was still a great moment especially for the kids. As soon as we approached the Abrolhos archipelago we meet with many humpback wales just jumping into the air next to the boat. Byamee had a lot of luck in running into a sleeping wale and lifted out of the water. 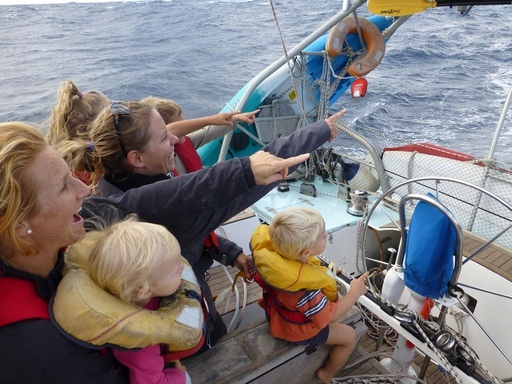 Joyce reported over the VHF that it was quite scary! 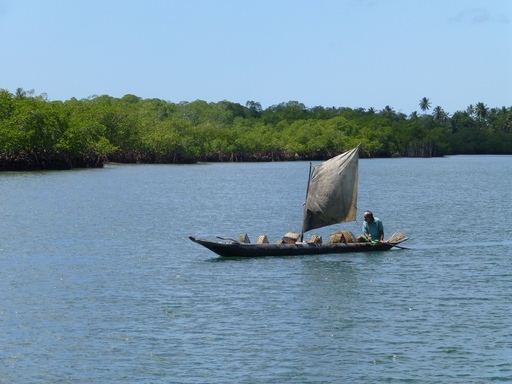 Our next anchorage was in the Camamu Bay at the mouth of Rio Saphino. There we had to fix first our water pump that filled our boat with sea water. 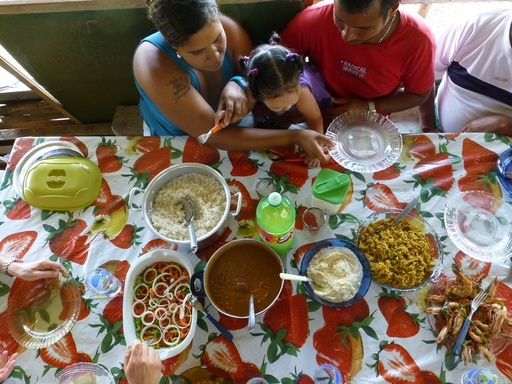 We went up the river to the market in Camamu to buy fruits and vegetables and had a great clean up on Tanque Island. Thank you so much Andre to organize the school and for the hospitality of your family! Continuing north we made it just in time to pick up my brother Franco in Salvador. He was after 12 years the first time on Pachamama. It was nice to spend some timewith him. At the moment we are anchored in front of Itaparica, where we had 66 primary school children on board and did a great clean up yesterday. In Itaparica we met also SY BalticSun again. We met the last time in March in St. Helena. Alastair and Ingrid's sun Michael introduced us to Copeira teacher Omara Silviada Canceicao Santos. Now our kids become Capoeira dancers. Many thanks for the Englisch translation to our member Hanna Law from Yankalilla in Australia!! One of the most significant things that we learned from our participation in the UN World Climate Conference in Durban, The UN Earth Summit Rio20+ in Rio de Janeiro and the World Expo 2012 in Yeosu, Korea, is that without the active contribution of every individual, nothing happens. We have once again inspired many students and individuals with our positive approach of utilising good solutions and sustainable initiatives to protect our climate. More details about this may be found in the Annual Report. Please enjoy also the short video that we made on St Helena. SY Pachamama also became a test lab in order to test and verify equipment under extreme conditions, and a new generation of batteries will be added from the NTU University in Singapore next month at SGS Trinidad. After the success of the 'TOPtoTOP Climate Solution Award' in 2010, we are now trying to organize another together with myclimate. The student with the best environmental activity organized from each continent, will be invited to see the best practice examples in Switzerland end of 2013. The strong network built among the first participants during this journey in 2010 was key to starting subsidiaries of TOPtoTOP in different destinations continuing our work. See the final report from 2010. 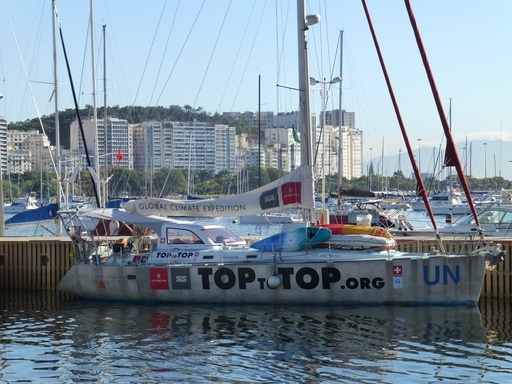 To get to the last two TOPs, we have decided to circumnavigate the two Americas in a figure 8, from pole to pole, and be the first expedition to do so. Next year our objective is to grow our community by incorporating more film and new media, with the ultimate goal being to get more and more people inspired for the future. 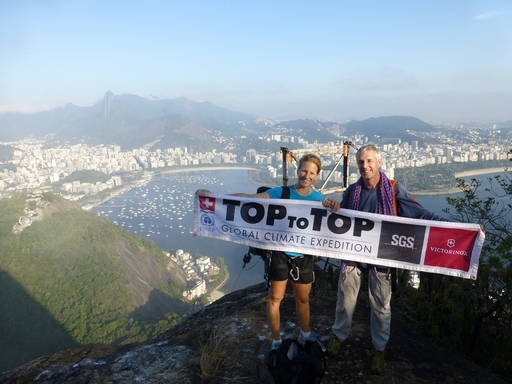 We would like to offer our sincere thanks to you all and specially to our main sponsors SGS and Victorinox for their continued support of the TOPtoTOP Global Climate Expedition.